Syracuse pride stickers coming soon…. To any Syracuse fans that have been unable to drink-away the painful memories of the Greg Robinson Era, the words “Orange Pride” – a phrase that GRob tried to popularize, and even had painted inside the walls of the football facilities – bring back terrible memories of lousy football, lopsided final scores, and ugly uniforms. In fact, one of the first things that former Head Coach, Doug Marrone did upon taking over the reigns at Syracuse was to paint over the large words, along with other cleansing techniques including burning the players’ old cleats, as a way of starting over without the bad mojo. Despite the fact that Syracuse’s practices have been closed to the public for the final two weeks of preseason camp, there have been reports that new Head Coach Scott Shafer and Athletic Director Darryl Gross have been working on one way in particular to highlight the players’ pride: Helmet Stickers. Many schools across the country utilize some form of pride stickers on the players’ helmets as way to reward the players for an exceptional performance during the game. From the iconic helmet stickers of Florida State’s tomahawk, to THE Ohio State’s pot plant Buckeye sticker. It is quick and easy to see which players have been having tremendous seasons based on how many stickers adorn their helmet. According to Dr. Gross, the idea of a helmet sticker had been in the works for some time and was actually one of the first ideas he wanted to implement. Unfortunately, the first few years were so lackluster, that there were few players deserving of pride stickers. So, he shelved the idea. After the turnaround began under Doug Marrone, and the quality of play on the field dramatically improved, the concept was renewed. The biggest question was what to use? Would a sticker of Otto the Orange be intimidating? Would the block “S”, a successful part of Syracuse’s re-branding efforts, be iconic enough? 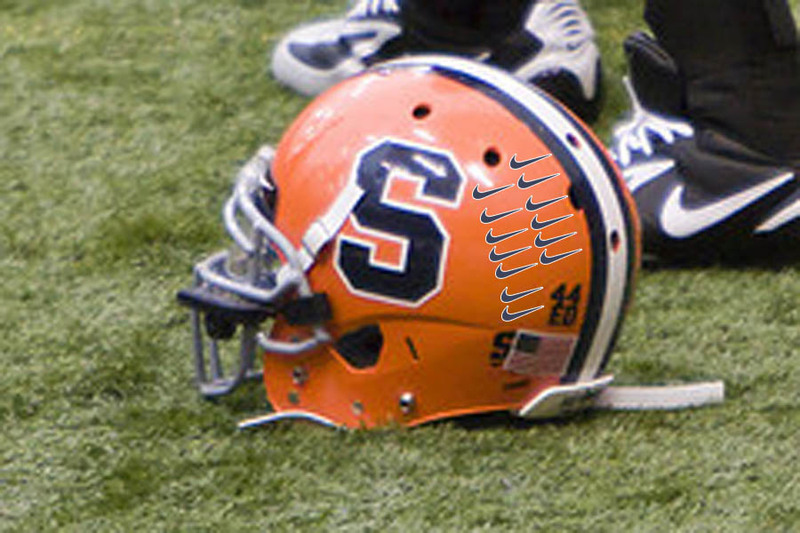 The Athletic Department started a small pilot program a few years back by adding stickers to the back of every player’s helmets; one with the letters “NY” memorializing Syracuse as “New York’s College Team”. The other, a more recent addition of the the number “44” above the letters “ED” for Ernie Davis. However, according to Head Coach Scott Shafer, neither represented the hard-nosed, blue collar attitude of Syracuse. After much thought, and countless numbers of meetings, the AD had an epiphany. He was standing beside the bronze Ernie Davis statue, seeking guidance and inspiration, when a vision popped into his head of the perfect pride sticker; the ideal emblem of Syracuse Athletics: the Nike Swoosh. Dr. Gross immediately pulled out his cell phone and started placing calls to his contacts at Nike; pitching his idea. When one cell phone started to lose battery, he quickly reached for his second cell phone and continued his calls. Within days, the first shipment of Syracuse pride stickers arrived on campus and were given to players during practice as a trial to reward their excellence. Dr. Gross’ vision has already started to reap benefits. The very first practice, the players ran faster, tackled harder, and made more circus catches than the coaching staff had seen throughout the entire training camp. The results were astounding, and as evidenced by linebacker, Marquis Spruill’s helmet below, is a harbinger of great things to come for the Syracuse football team this year. Helmet of Linebacker Marquis Spruill, after 2 practice sessions is currently the leader of all helmet sticker recipients. While Dr. Gross believes that although the performance during the game is important, the pride stickers should expand beyond outside of the sidelines and endzones as well. In partnering with Nike, they are creating the SWOOSH program, which will be modeled to other schools as well. H – Helping Nike advance their brand recognition and increase profits. There’s nothing more intimidating than a swoosh or as important as helping Nike increase their profits.